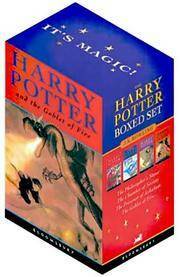 A boxed collection of the Harry Potter series from celebrated author, J K Rowling. Bloomsbury Publishing. Hardcover. New/No Dj cover as issued. Mint condition.First published as completed deluxe boxset in 2007 by Bloomsbury Publishing. Please note: Due to the fact that the boxset is sealed, we cannot identify what are the printing run numbers of the books.Deluxe edition boxed set contains all 7 books in the series. All 7 deluxe books are true collectors editions with their high quality hardback covers bound in fine cloth with JK Rowling's signature embossed in gold lettering and fine gilt edged pages. The slip case is red colour with gold print of all seven titles on the back of the case and gold print of the Author's signature & Hogwarts Express on each side of the slip case.The box set is new and shrink wrapped.3442pp. A collectable boxset.Please note: This is very heavy boxset(approx 7 Kg). This is another paragraph Product Description: A fabulous opportunity to own all seven Harry Potter titles - Harry Potter and the Philosopher's Stone, Harry Potter and the Chamber of Secrets, Harry Potter and the Prisoner of Azkaban, Harry Potter and the Goblet of Fire, Harry Potter and the Order of the Phoenix, Harry Potter and the Half-Blood Prince and Harry Potter and the Deathly Hallows - in a fantastic boxed set. 2013-08-15. New. Ships with Tracking Number! INTERNATIONAL WORLDWIDE Shipping available. Buy with confidence, excellent customer service! 20010109. Good. Ships with Tracking Number! INTERNATIONAL WORLDWIDE Shipping available. May not contain Access Codes or Supplements. May be ex-library. Shipping & Handling by region. Buy with confidence, excellent customer service! Bloomsbury Childrens Books. PAPERBACK. 1408898659 Special order direct from the distributor . New. Raincoast Book Distribution. Used - Very Good. Ships from Reno, NV. Great condition for a used book! Minimal wear. 100% Money Back Guarantee. Shipped to over one million happy customers. Your purchase benefits world literacy! Bloomsbury. PAPERBACK. 0747557012 BOOKS IN VG CONDITION, NO BOX . Very Good.